Given the inaccessibility of much of his music, Gerry Read is refreshingly unpretentious. He is particularly open about his threadbare production technique, and confesses it only take him an hour or two to produce a track. This admission isn’t entirely surprising given the mechanical repetitiousness of each of his tracks: battered, muddied 8-bar loops with little deviation. And yet his retro take on house and techno is refreshingly resolute in its adherence to this hulking industrial sound. The breeze-block beats are always presented as roughshod and crumbling around the edges, a strangely mesmerising state of dilapidation. His first outing on Aus does not stray especially far from this unyielding formula. 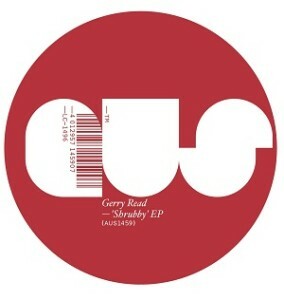 But title track ‘Shrubby’ does provide a more bite than usual thanks to some sharper snares – a nice counterpoint to the bluntness of his trademark thuds – and a clipped diva vocal that might win over those who find Read’s techno surfaces a little too opaque. ‘Zig Zag’ returns to his muddier soundscapes: rigid monolithic beats pummel against a swirl of foggy synths. Berlin techno producer Redshape steps up for a madcap remix of ‘Shrubby’, dousing it in shrill synths and frenzied buzzing. His ‘disco’ remix is thankfully more straight-laced, looping a pitter-patter of percussion as a squiggle of acid slowly emerges during the eight minute progression.